Memphis was a stranger experience for us than I'd anticipated it would be... I think the point this most struck home was when we stood watching a group of ducks emerge from their fountain in a hotel lobby before proceeding down a red carpet and into an elevator bound for their penthouse. This strange sight can be witnessed daily in Memphis' very grand Peabody Hotel, with the proceeding announced and guided by hotel's regally dressed Duck Master (the fifth person to hold the position). Here is a picture of him leading the proceedings and a video of the ducks making their grand exit. 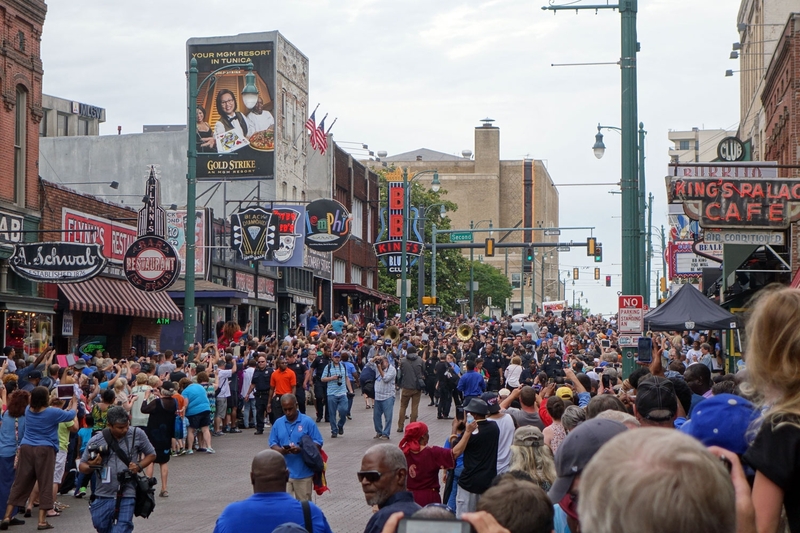 To be honest, after that very odd experience, I expected the remainder of Memphis to be dimished in comparison, but there was plenty more that happened in our short, 1 night visit. Before witnessing the duck march, our first visit on the agenda when we arrived in Memphis was to see the strange sounding 'Pink Palace' while waiting for our check-in time. By coincidence the museum has free admittance on Tuesday afternoons from 1pm-5pm which was perfect for us. It was a house owned by the creator of the Piggly Wiggly supermarkets (interestingly, the first ever 'self-serve'-style store in the USA) which now hosts a sort of natural history museum crossed with an American history museum inside it with a paid IMAX and planitarium. 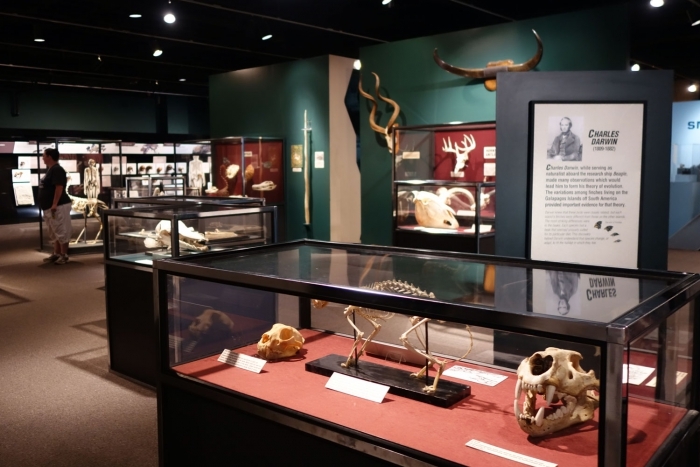 It was a fun way to kill an hour or two but I don't think we'd have actively considered it something worth paying to do unless you are particularly interested in some aspects of the collection. 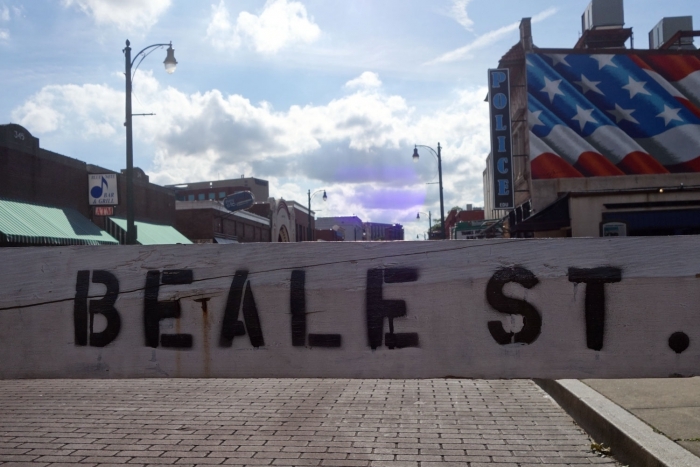 Certainly the most famous street in the city is Beale Street - a road lined with blue bars and shops. Our plans for the evening and the location of our accommodation on the outskirts meant that we had to check the street out a little more earlier than we'd have liked so we didn't get to see experience it, as I suspect it is optimised for, in the evening when the the various venues were more full and active. I can imagine though that if you visited after thinks had heated up a bit, it would be a very different place! In the mean time, I was happy to snap away at the various shop-fronts and watch as a group of cars were parked up to be displayed by their proud owners. We couldn't stop in Memphis and not have a Memphis-style barbecue. The is a little different than the Texas-style, with their dry ribs being all about the salty and spiced dry rub which coats the ribs. We found a slightly less touristy shop called "The Bar-B-Q Shop" on Madison Avenue. It was a bit out of town and the place felt like it was filled with many more locals than tourists which was somehow comforting (although one of the waiting staff seemed a little terrified to talk to us when we asked for his advice on some menu items). We grabbed a massive set of dry ribs and some sides and ate until we felt like we'd explode. The meat was soft and spices tasted and smelt great. 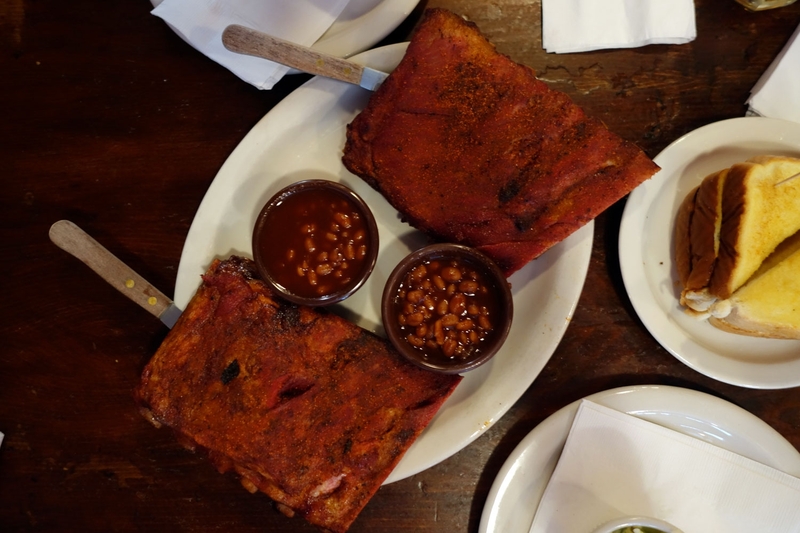 Now that I'm becoming a more seasoned self-professed barbecue expert, I think my heart still is on the amazing, slow cooked Texas smokehouse BBQ, but the Memphis-style ribs were still really tasty - you need to try them out! Content we managed to get back to the motel just before the food coma properly set in! Elvis, if you are still alive (how is working for the DEA going?) and reading this, you need to get some nicer representatives. 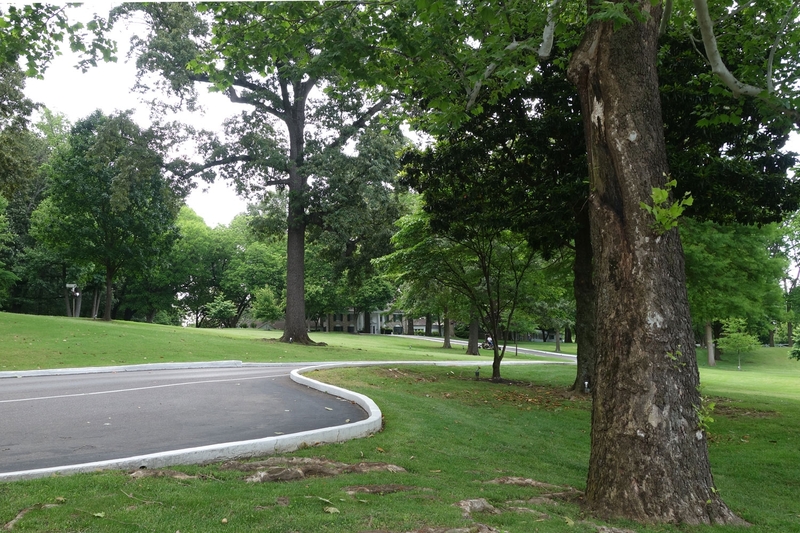 Not being massive Elvis fans, we weren't keen enough to pay the $36-40 per person entry fee to check out Graceland properly but being in Memphis wanted to give it a token look. Lisa discovered that there was a pretty good alternative for people like us; the Meditation Garden (where he is buried) is free of charge for people entering between 7:30am and 8:30am. We didn't mind getting up a bit early and figured this would be a good way to get a peak at the grounds without paying an arm and leg for the entry fee. Our arrival at Graceland set the tone for the visit; $10 to park the car for 20 minutes was pretty steep, but sure, we were getting close to 8:20 and figured we'd take it on the jaw. When Lisa held out the cash however, the attendant gave a look that informed us that the 1 meter between her seat and the cash was a gulf she was not interested in bridging; I had to get out of the car to bring it to her. Parking space found and a brisk jog finally got us to the gate with 10 minutes to go. We got several steps through the gate before someone from the security booth emerged and stopped us. They were sending people down from the garden now and we wouldn't be able to go up and see it. Screw you Elvis - if you don't want us to visit, just tell us directly! The worst $10 I think we spent on the entire trip! 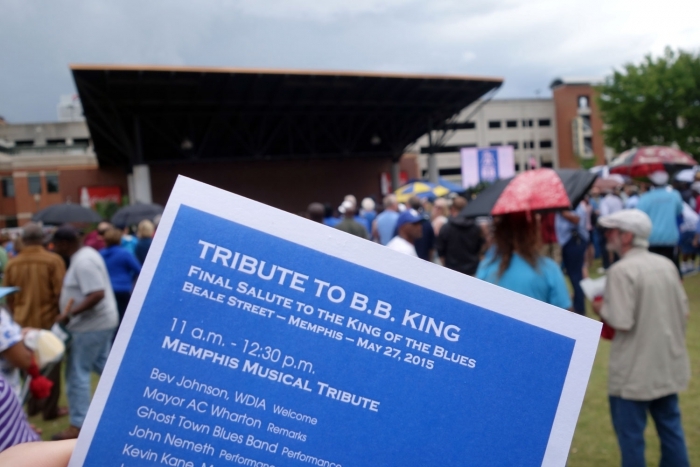 Unbeknownst to us when we first arrived in Memphis, we had timed our visit to perfectly coincide with the memorial service and procession of a recently passed away legend, "the king of the Blues" B.B. King, who first made a name for himself in the city on his rise to fame. We would almost have missed this had we not by chance asked at the reception of our hotel if there was anything interesting happening in Memphis during our time there. 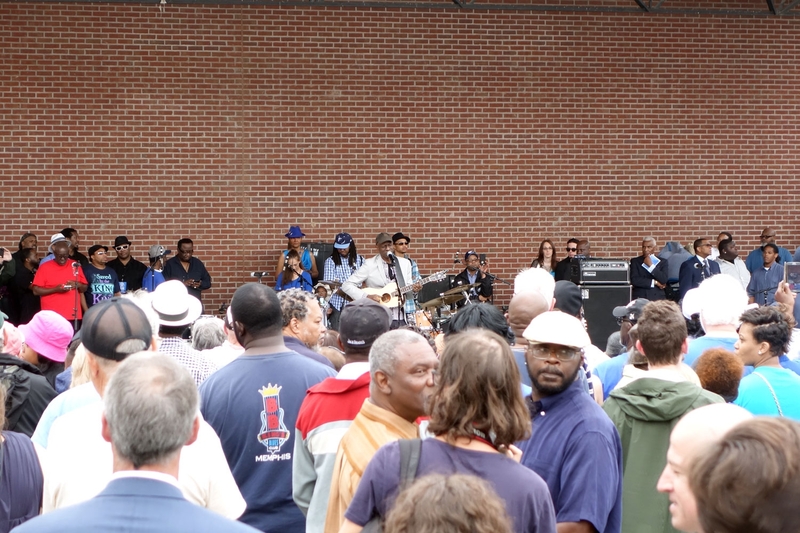 The event was held just off Beale Street which we'd visited the previous day, in Handy Park. There a stage hosted a series of emotional performances and speeches from various people wanting to pay tribute to this much loved man. 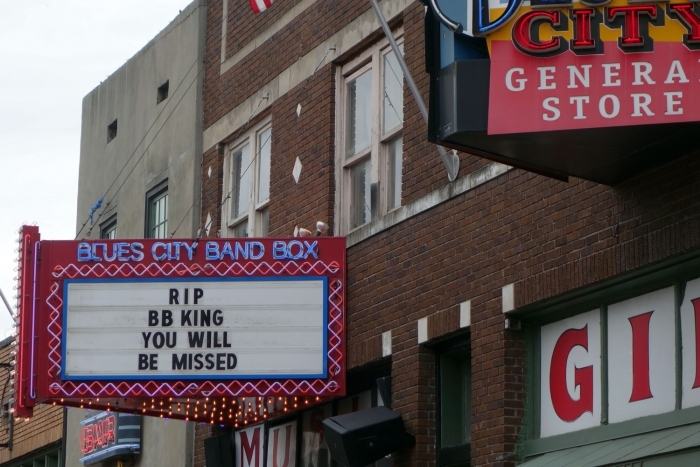 The event at the park ended then moved out on to Beale Street itself where the hearse drove down, past B.B's club on towards his home town in Mississippi, followed by a vast crowd of friends, relatives and fans. With that we said our farewells to Memphis and it's many strange experiences, and headed on to our next adventure in Nashville!